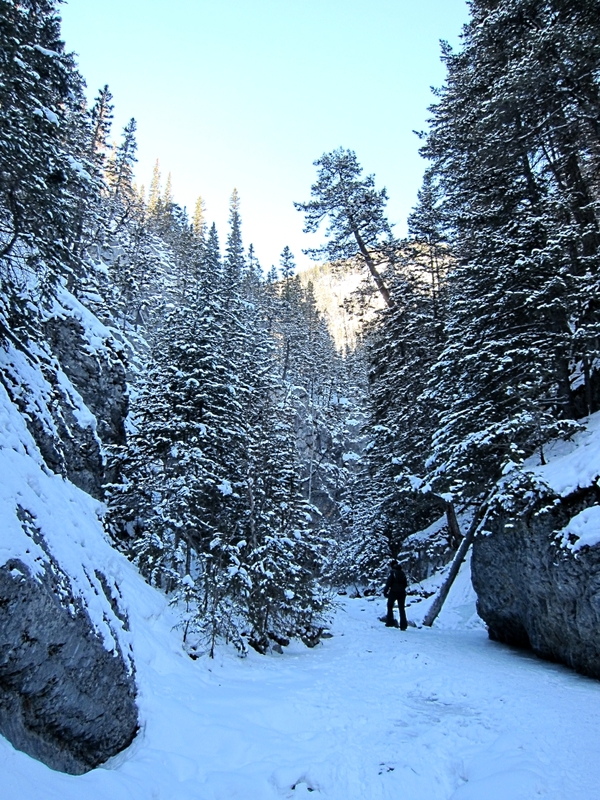 Sunday was our second day-off from skiing and the second part of Ruth and Tim’s Christmas present to me, a guided walk in Grotto Canyon near Canmore. It meant an early morning start as, unlike last week’s afternoon amble, we were being picked up at 08.15 outside the hotel. Once again it was clear blue sky, bright sunshine, and very cold but we are getting used to -20oC now. 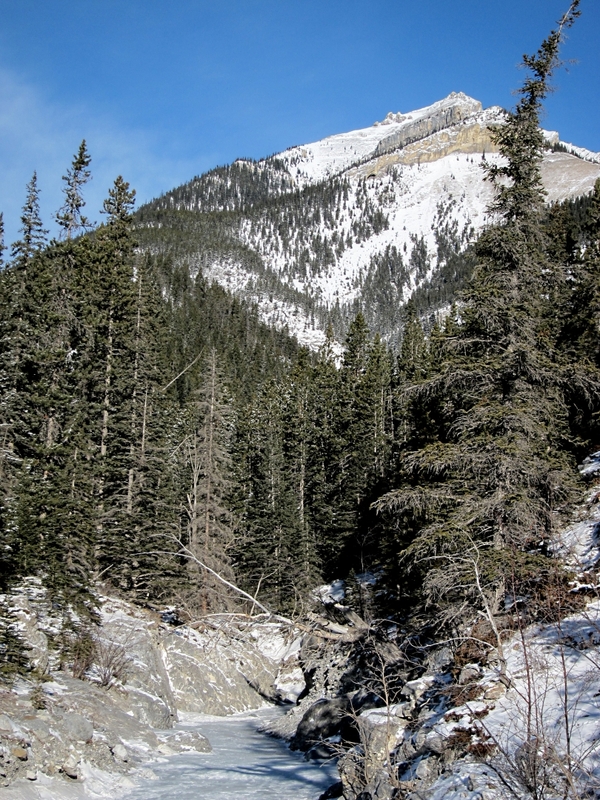 Grotto Canyon is just outside the Banff National Park. The National Park boundaries seem oddly defined. 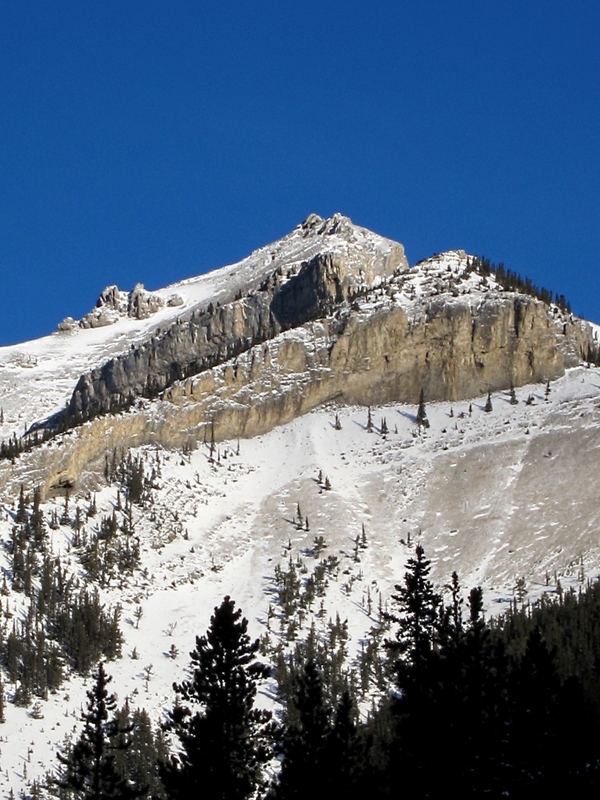 Immediately to the West of the Banff Park are the Kootenay National Park and the Yoho National Park and the boundaries of the three are contiguous. 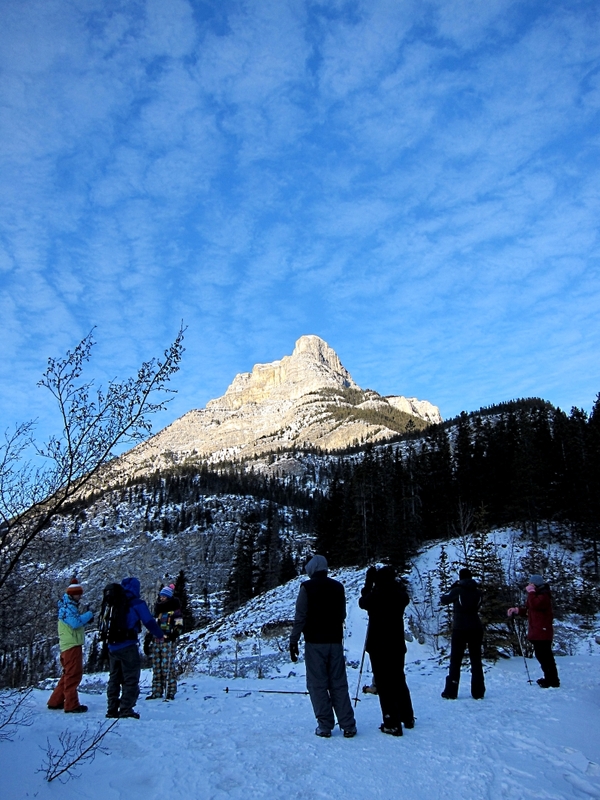 The Banff Park is in Alberta and the latter two are in British Columbia. But I can’t help wondering why they are not all one big National Park given that they are all regulated and managed by Parks Canada. In the UK National Park boundaries ignore local authority areas and planning control is exercised by an independent National Park Authority. However strange the definition of the parks, it certainly seems to be true that they are controlled very strictly and in the interests of the environment and the landscape. 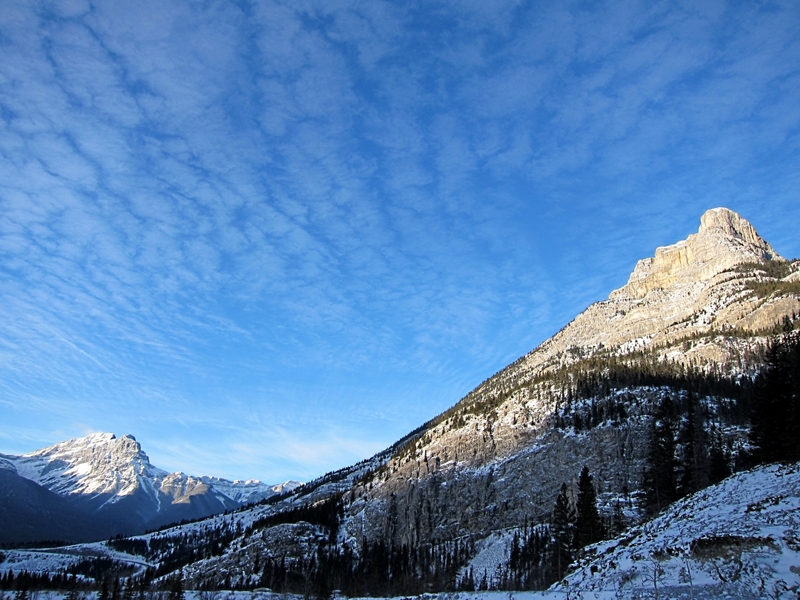 It was impressive coming back into the Banff Park at the end of the morning. The ‘Gateway’ is marked by large wooden signs and huts. What is more impressive is that the Park boundary is marked on the forested mountainside by a straight line cut through the trees, etched in white by the snow and very visible. But, as is so often the case, I digress. The minibus parked in a snowy car park at the beginning of the trail where we strapped cleats on our boots and those who wanted them were issued with walking poles. And we set off through the trees on a narrow but clear trail. The cleats, a strap-on sole of sharp-edged studs, give very good grip on compacted snow and made walking considerably easier, even when we dropped down into a rocky gully and climbed out the other side. In the Rockies even more than at home, in winter the morning is quite advanced before the sun clears the surrounding mountains and touches the valley floors, and then only for a short time. As we followed the trail around we came to a clearing in the forest at the entrance to the canyon and spectacular views of surrounding peaks. It was remarkably windy in the clearing as we were out of the shelter afforded by the trees so we didn’t linger but headed straight into the canyon. That was a dramatically different environment and a whole different way of walking. 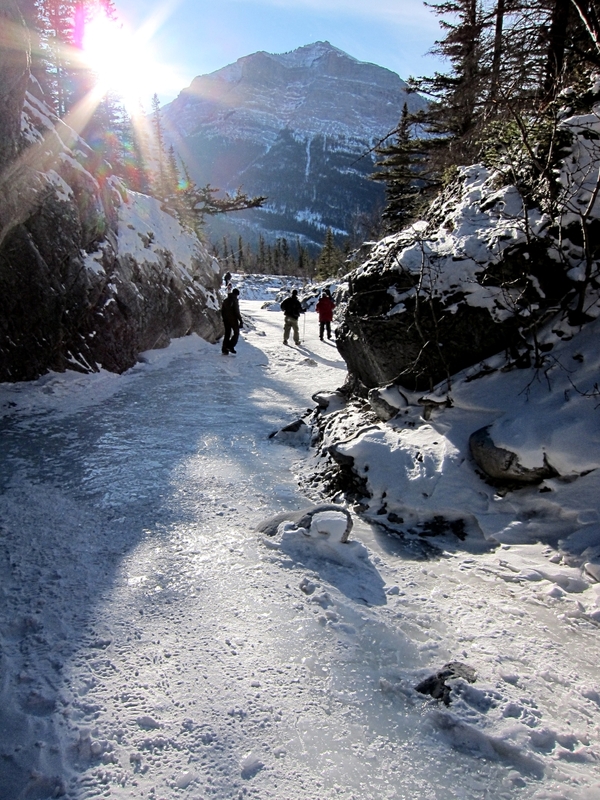 We stepped off the trail through the forest and onto sheet ice. 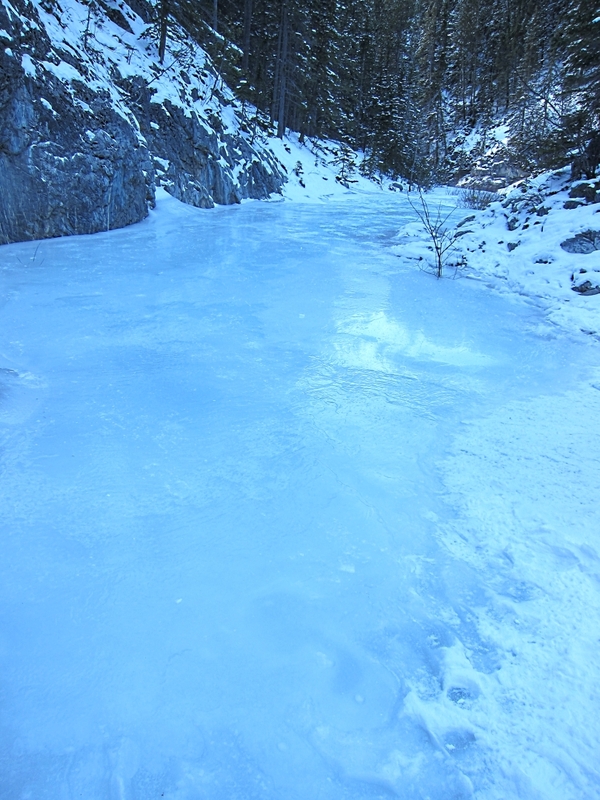 I mean 20 foot wide sheet ice, sloping upwards, rippling like the surface of a river but frozen solid as if in an instant. The cleats are not as effective as crampons on bare ice but reasonable traction can be achieved by stomping like a petulant child. 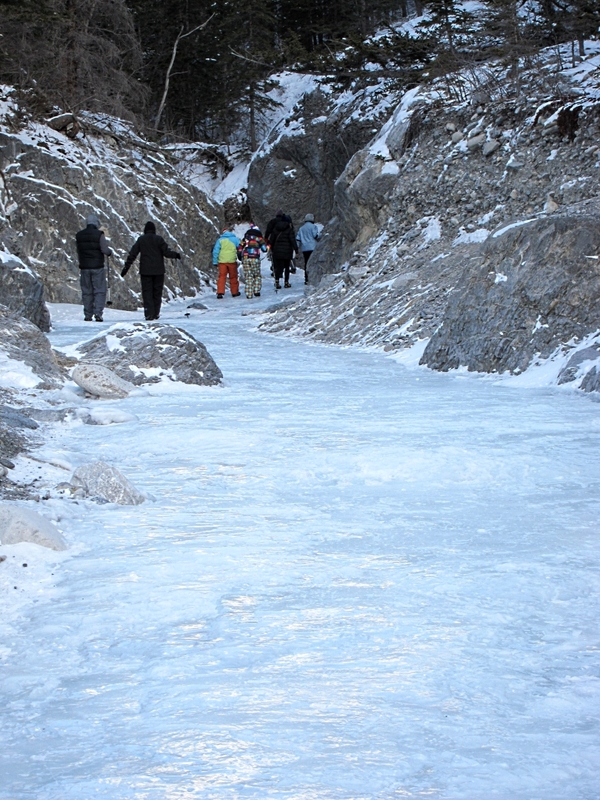 The rest of the walk is up the frozen river. In places it is as smooth as glass. Now and again the river, which is still flowing underneath the ice, pushes under pressure up to the surface and the ice has a slushy topping like a brand of ice-drink. In other places thin snow deposits give a better grip. Smooth as glass and very blue. 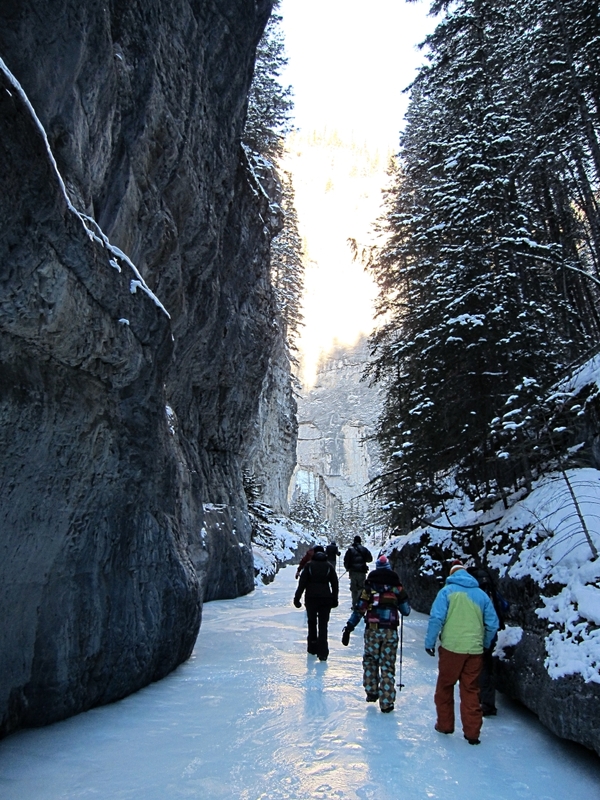 The canyon is narrower than Johnston Canyon with vertical rock walls in places so close together that they could be touched on both sides at once. It was completely protected from the strong wind but bitterly cold. 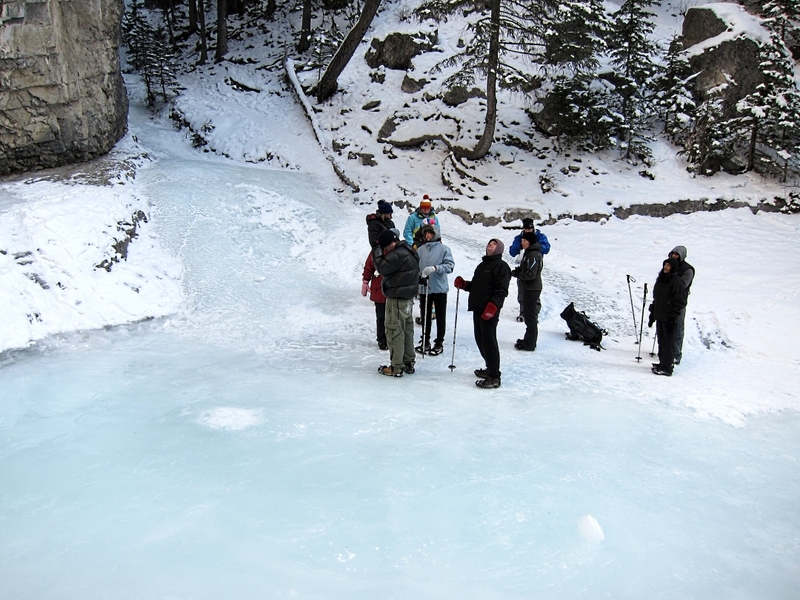 We stomped up the frozen river for about half an hour. Eventually the canyon broadened slightly as we reached the towering vertical headwall of the canyon where 2 rivers converged. 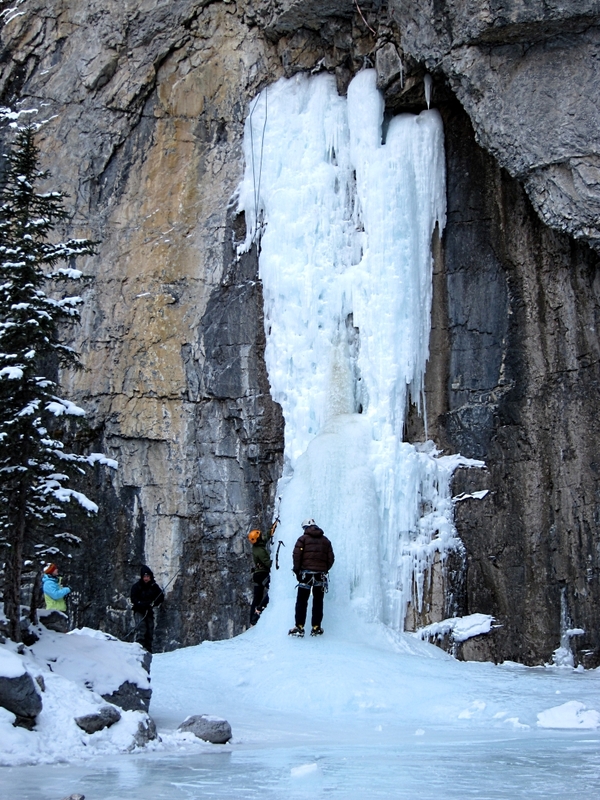 Frozen icefalls coming out of the cliff with ice-climbers playing on them. After a stop for hot chocolate and maple cookies (biscuits), which the walk guide carried in a large rucksack together with emergency kit we set off back down the canyon. By now the sun had cleared the mountains on the other side of the main valley and for a short time was shining directly into the Canyon. It was very pleasant. Not quite like basking in Greek sunshine, the temperature ’high’ of -15oC made sure of that, but very pleasant nonetheless. Dark clothing certainly absorbed what little there was of the sun’s heat rather than reflecting it. The walk back to the end of the canyon gave a quite different impression. 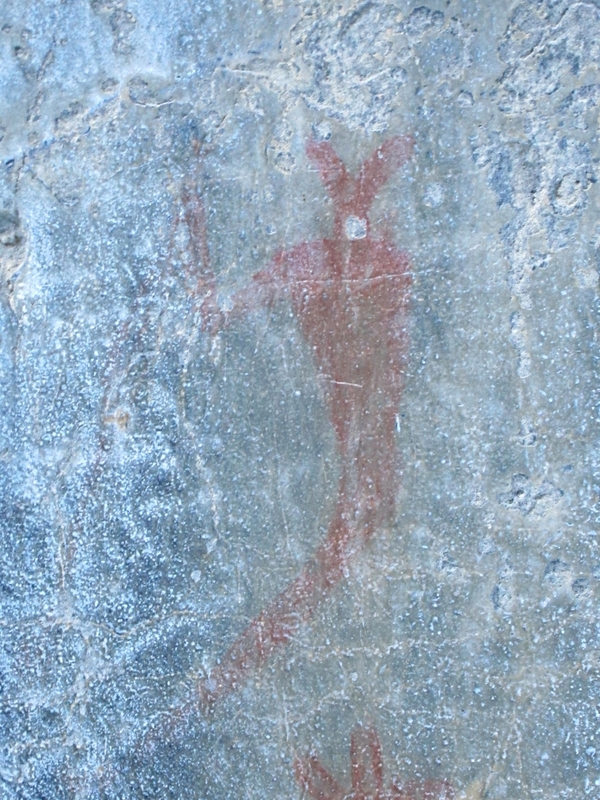 We reached the open area at the mouth of the Canyon with the sun now on it. 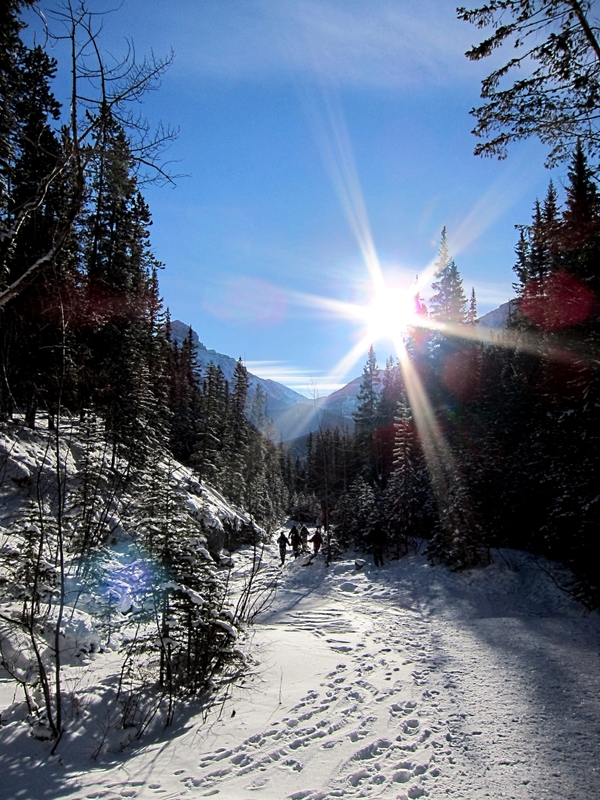 I think it was the sunshine which gave this walk a warmer, friendlier feel than Johnston Canyon. But that could just be down to the time of day. We began the Johnston walk after the sun had passed its zenith and walked into the dim light of evening. This walk we started early and had the pleasure of finishing with the sun at its height. My vote would be for early morning walks, more of a trauma first thing, tottering out of bed blinking and shivering into the morning light and -20oC but with a much more enjoyable finish and leaving the afternoon for other things. More about which later.